Over-fishing means UK trawlers have to work 17 times as hard for the same fish catch as 120 years ago, a study shows. Researchers used port records dating from the late 1800s, when mechanised boats were replacing sailing vessels. In the journal Nature Communications, they say this implies "an extraordinary decline" in fish stocks and "profound" ecosystem changes. 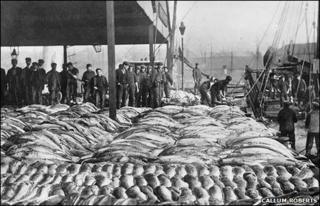 Four times more fish were being landed in UK ports 100 years ago than today, and catches peaked in 1938. "Over a century of intensive trawl fishing has severely depleted UK seas of bottom living fish like halibut, turbot, haddock and plaice," said Simon Brockington, head of conservation at the Marine Conservation Society and one of the study's authors. "It is vital that governments recognise the changes that have taken place (and) set stock protection and recovery targets that are reflective of the historical productivity of the sea." In the late 1880s, the government set up inspectorates in major fishing ports in an attempt to monitor what fish were being landed. "The records are pretty reliable," said Callum Roberts from the UK's York University, another of the study authors. "The Victorians were very assiduous about collecting information; and while some of the landings might have been missed from smaller ports, the larger ports were covered very efficiently," he told BBC News. Around the same period, naturalist Walter Garstang was beginning to analyse "fishing power" - essentially, the capacity of a fleet to catch fish. The biggest change over the period was from sail to engine power. "But when you got engines, that meant they could fish in any conditions of wind or tide and sea bed." As waters near the coast became depleted, industrialisation also meant the UK fleet could travel further in search of new grounds - a phenomenon that took off after 1918. But despite the growing power and range, the amount of fish caught for each unit of effort has gone drastically down, with 17 times more effort required now to catch the same amount of fish as compared with the late 1800s. Philip MacMullen, head of environmental responsibility at the UK's industry-funded sustainability organisation Seafish, suggested that accenting the historical picture could obscure more recent improvements. "It could be correct but I don't know, and I don't think the data support the findings," he said. "But it's old news. Fifteen years ago we started understanding how badly management was working, and 10 years ago we started doing something about it." Seafish points out that in the last decade, stocks of some species such as cod have shown increases. But Professor Roberts counters that the long historical timeline in his study shows the recent improvements to be small in scale. "If you get a 50% increase from 2% of a species' former abundance, you get to 3% of its former abundance, so you shouldn't celebrate too hard," he said. "That's why this perspective is important." Whereas UK fishermen tend to blame the EU's Common Fisheries Policy (CFP) for their economic problems, the authors of this study say it proves that depletion stems from mismanagament well before the CFP came into existence. "There's nothing basically wrong with the CFP and not much wrong with the scientific research they receive," commented Dr MacMullen. "But what happens to that advice when it goes up to the Council of Ministers - it's completely mis-managed."